Today, just an ordinary Cornish Friday in June we decided to head over to Church Cove at Gunwalloe. It’s been a while since we visited this haunt that was a childhood favourite. We parked in the little National Trust car-park and strolled toward the beach. Some figures approached along the lane. Strange, thought I, those ladies are heavily dressed for the time of year… long skirts and shawls. Then a ragged man, his skin burnt a deep bronze, hair wild and ragged, torn white shirt open to the navel. Ahhhh, it slowly dawned on — someone’s performing a play, maybe a photo-shoot. Then more actors approached, in twos and threes, a small squadron of extras. 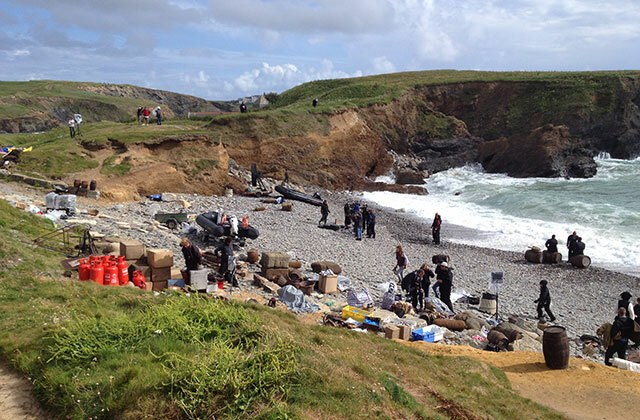 It was soon apparent that there was a full film crew, shooting a scene of shipwreck perhaps, at Dollar Cove. Barrels and bundles drifted in the small surf. We watched a while, wondering what the production might be. A Rosalind Pilcher perhaps? Returning home I Googled. A new Poldark! Due to screen in 2015. I have dim recollections of the 1970s version, so look forwad to seeing what the BBC make of Winston Graham’s epic tale of Cornish passion and enterprise this time around. Church Cove and Dollar Cove are just beyond Gunwalloe itself on the Western side of the Lizard Peninsular. Church Cove is a lovely, sandy, sheltered beach – life-guarded in summer. Dollar Cove is adjacent and dog friendly all year – its name is said to be derived from takes of a Portuguese treasure ship that sank offshore in 1526 and/or from a ship carrying silver dollars, wrecked nearby in 1783. Between the two beaches is a little headland and a fascinating 15th century church, with an unusual stand-alone tower.